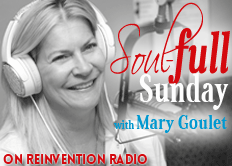 Mary may be gone this week, but we can still be soul-full! How do you keep your future thriving? The Reinvention Radio Crew along with special guest, Michael Levitt, discuss how the decisions we make today define our future. Especially in the areas of health, wealth, career, and family. Invest in yourself everyday and sweat the small stuff... two pearls of wisdom shared in this episode.